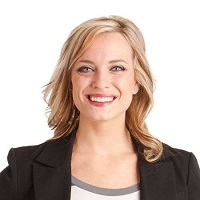 Posted by Becky Engen on 1:04 PM on March 4, 2014 . Sustainability is a big buzz word these days. It's got to be sustainable! But what does sustainability look like in the real world? We think our New Home is a good example of it. Here are the ten ways that our new home is super green. LEED is an overall measure of how green a building is. You earn points for green building techniques, using eco-friendly materials and having a carbon-reducing plan for how a building will be used. Our New Home has been certified as meeting the LEED Silver standard. This is an overall stamp-of-approval from the experts on green building. Twin Cities Habitat picked its new location in part to make it extremely easy to access by public transportation. This will really take affect when the Metro Transit's new Green Line light rail begins operating in June 2014. That train will connect Downtown Minneapolis with Downtown St. Paul. There's a stop less than a block away from our front door. We hope a lot of our visitors will come by light rail. The other green transportation aspects of our New Home include parking spaces reserved for hybrid vehicles and a bike lock-up that should be very popular come spring. Every step you take in our New Home you're walking on a good idea - especially when you're walking on the triangle carpet that seems to be everywhere. It's got a cool, modern feel. But best of all it's all remnant carpet that we saved from being thrown away. 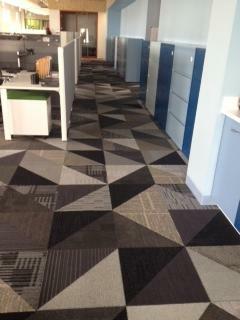 No one had large enough carpet remnants to cover the large spaces in our offices but we found a company that was willing to cut their remnant chunks into triangles. Another plus, if one gets a big stain on it we can simply pull it up and replace that triangle. Time to get a little technical. The heating, ventilation, and air conditioning (HVAC) in our New Home is done by two high-efficiency, gas-fired hot water boilers. Both register at more than 90% efficient. There's a high-efficient condensing unit on the roof to move air around the building and help regulate the temperature. The air flows through a duct system with fan powered by standard VAV boxes and hydronic reheat. Both the fan system and the hydronic heating system allow us to control temperatures to match the needs of our staff. That way we won't waste energy heating and cooling empty spaces. The water fixtures in the building are 30% more efficient at reducing water usage than the baseline products in other LEED buildings. Plus, our "smart plumbing" system uses recirculating hot water pumps and zoned piping to eliminate long runs of hot water throughout the building. That means you don't have an entire pipe of hot water running hundreds of feet to each bathroom when you only need enough to wash your hands. The best upgrade from our old building to our new one: windows. There were about three in the last building. Our New Home is flooded with daylight, dramatically reducing the need for overhead lights. In most of the places we do have lighting it is the high-efficiency LED stuff. Lights throughout the entire building are on sensors so they shutoff if someone forgets to turn them off manually. This winter we're all being reminded of just how cold it can be in Minnesota. Fortunately, our New Home has a warm blanket of at least 2 inches of foam inside every exterior wall. This will dramatically lower the amount of energy that's needed to heat the home in the winter (and cool it in the summer). Twin Cities Habitat for Humanity is always looking for ways to cut down on our paper use. There are some innovative approaches built right into our New Home. One is the paint. Many of the meeting rooms have a special coating product called Wink which turns any wall into a writable/erasable surface. Snap a picture of the notes with your smartphone and there's no need to have handouts or paper notes from any meeting. 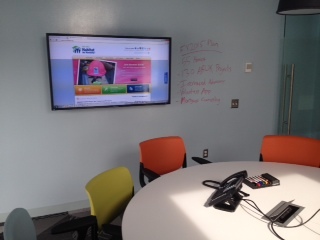 TV monitors in meeting rooms are also wired to display laptops with an easy 1-cable connection. We even shrunk the personal waste baskets at each cube (while keeping the recycling baskets full size) to shift how people thought about the trash they generate. Our New Home was designed to catch rain water on the roof and direct it to a rain garden in the middle of our parking lot. This will cut down on the water flowing directly into the storm sewers and away from our underground aquifers. We're going to catch the rain, keep it local and keep those underground aquifers full. All these eco-friendly aspects of our New Home aren't just for the good publicity and warm fuzzies about protecting the Earth. They're also going to help us save money. 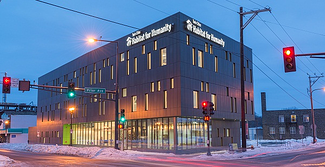 We forecast that thanks to the energy efficient design of our New Home, Twin Cities Habitat will save roughly $20,000 a year in utility costs. That'll add up to half a million dollars over the lifetime of most of our systems. That's money that will go right to our bottom line and our mission of eliminating poverty housing in the Twin Cities.